Women replace their toothbrush for every 3 months while as men are more likely to wait for more than 6 months. Dentist in Balmain recommend that changing a toothbrush for every three months is mandatory for maintaining your oral hygiene. Keeping your teeth clean is the main thing to consider when it comes to oral health and hygiene because toothbrush can easily remove bacteria and plaque from the mouth. Do you know why dentists often ask you to change your toothbrush for every 3 months? Toothbrushes can have over millions germs and bacteria, if it’s not changed frequently, these organisms can be potentially grow and then they can re-enter the mouth during brushing. If there are any cracks in the gum line, these bacteria can easily enter into the body, thus causing many ailments. That’s why it is important to keep your toothbrush clean and change it regularly. Brushing your teeth is an essential thing to be maintained for a healthy and hygienic oral care. Brushing your teeth for nearly 2-3 times a day has been proven to drastically improve the oral health and is a powerful tool in preventing plaque, decay, gum infection and other diseases. Here are 4 tips on toothbrush maintenance and disposal that can make all the difference in your oral health. Disposing of an old toothbrush and switching over is important for maintaining healthy gums and teeth. 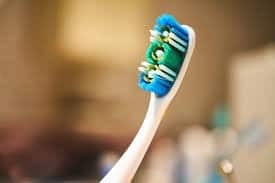 While brushing, bristles in your toothbrush become worn, bent, and frayed, this in turn hit the gums in a bad way, leading to gum inflammation or irritation. Once you’ve gotten cold or illness, you must dispose the toothbrush that you’ve been using. Since many diseases and sickness can be present in the mouth and saliva, it is likely that your toothbrush remains as the ground for virus and bacteria. So, it’s must to replace your toothbrush after illness. Toothbrushes should be stored vertically and this prevents water, which may contain bacteria to collect. Additionally, you should make sure that no toothbrushes touch heads as this can lead to the spread of virus, germs and bacteria. Sharing toothbrushes can lead to the spreading of germs and bacteria and as a result of sharing illness and infection. Each member of your household should have their own toothbrush and the toothbrush should be kept somewhere safe away from infection. Experienced dentists from Dental Clinic in Balmain recommend that by following all these tips, you can make sure that your teeth and gums are receiving quality treatment. Take care of your toothbrush and keep your mouth feeling fresh! Soothing Care Dental focus on comfort and pain-free treatment for a relaxing dental experience with state of the art technology using our advanced microscope ensuring the highest quality dental care.